Pollinators (such as this honey bee) often are in, or around, agronomic crops. Honey bees and other pollinators are a vital part of our agricultural system. The USDA estimates that pollination in the United States is worth roughly $14.6 billion. Although this (or any such estimate) is approximate at best, pollination’s value is staggering. Although agronomic crops such as corn, soybeans, and wheat do not require pollinators to produce a crop, foraging bees are extremely likely to pass over or near agronomic crop fields in Indiana and states with similar cropping practices. As a result, agronomic crop producers can have a major effect on pollinator health. 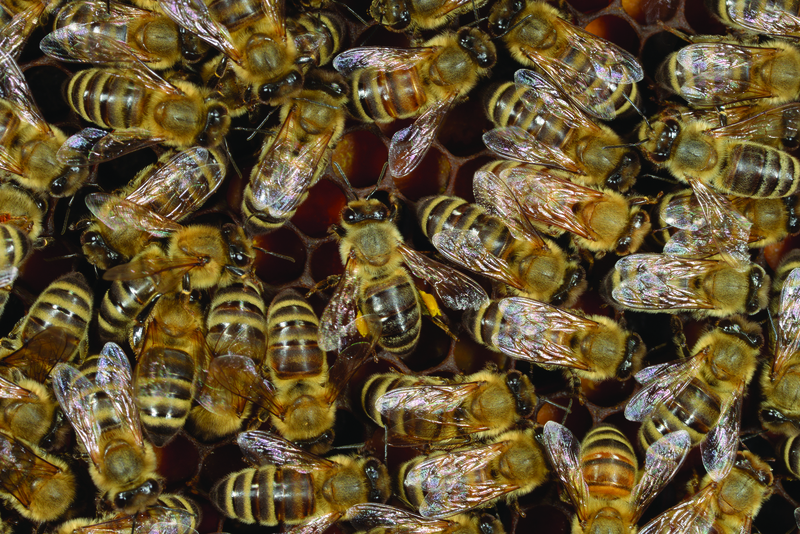 This publication focuses on simple steps that agronomic crop producers can take to minimize the negative effects of pesticide use on honey bees and other pollinators. Honey bees and pollinators face a number of stresses, including loss of habitat, various diseases, and Varroa mites. While agronomic crop producers may not be able to control all these stress factors, they have some control over the application of pesticides (particularly insecticides). These products can kill honey bees or other pollinators outright. Even if a pesticide doesn’t kill, a sub-lethal dose may reduce the pollinator’s ability to perform routine tasks, or to orient to pollen, nectar sources, and the colony. Exposing pollinators to sub-lethal levels of pesticides can also render them more susceptible to any of the other stress factors mentioned above. Remember that bees won’t encounter any stress factor in isolation; usually two or more are present at any given time. This is the main reason that working out a single “solution” to the decline of honey bees and other pollinators is unrealistic. Figure 1. The close quarters of a honey bee hive make it easy to spread diseases, mites, pesticides, or other stressors. It’s not necessary to spray honey bees directly with pesticides to harm them. Honey bees consume pollen, nectar, and water to survive. All of these resources are potential sources of pesticide exposure. In addition, pollinators may be exposed to pesticides en route to collect these resources — planting dust or pesticide liquids may be suspended in the air as they fly through it. Indiana is a heavily agricultural state, and pollinators may be attracted to a crop that is in bloom. Flowering weeds in a treated corn or soybean field may attract pollinators — especially when the crop itself has no flowers. Look in and around agronomic crop fields in early spring before planting or in adjacent ditches or roadsides throughout the growing season. You’ll see a wide range of flowering plants. Although many of these plants are weeds to you — dandelion, henbit, wild mustard, white clover, yellow rocket, sweet clover, milkweeds, goldenrod, and aster blossoms — they provide a range of options for foraging pollinators. In addition, honey bees and other pollinators will sometimes forage on agronomic crops that are producing pollen or nectar, including corn pollen and soybean nectar — the latter can even produce soybean honey. If you apply foliar insecticides to corn and soybeans, it is often when the crop is flowering. These applications will likely kill pollinators that visit during the application or shortly after it. 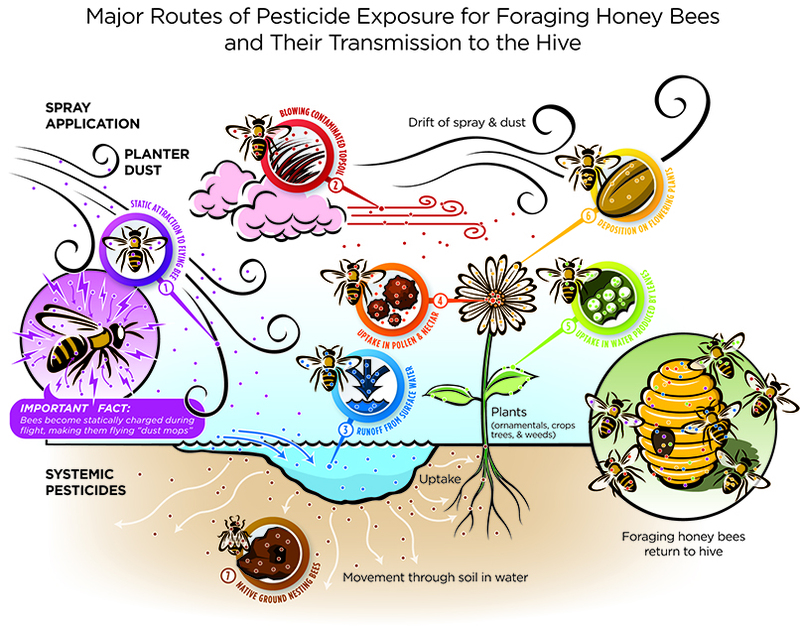 When pesticides associated with field crop production kill pollinators, it is often because they were directly exposed to the pesticide or the product drifted onto flowers that the bees were foraging on. In addition to these exposures, systemic insecticides can expose pollinators to insecticides in other ways. One of the most commonly used insecticides in field crop production, neonicotinoids, are applied to virtually all the corn and the vast majority of the soybean seeds planted in Indiana and throughout the Midwest. These insecticide-treated seeds can harm pollinators even if the pollinators are not foraging in the crop. The pneumatic planters routinely used to plant neonicotinoid-treated seeds can produce dust in the exhaust. This dust has been shown to contain extremely high levels of neonicotinoid residues. These residues can contact pollinators and kill them (Figure 2). What’s more, honey bees become statically charged during flight and any dust they encounter during flight will adhere to their bodies. The pollen produced by corn plants that were grown from seed treated with a neonicotinoid insecticide will often have residues that are toxic to pollinators. In addition, there may be residues left in the soil from treated seeds from previous growing seasons — both crop and non-crop plants may take up the insecticide at very low levels. As a result, neonicotinoid residues are common in the pollen and are present (but less common) in many types of plant nectar. Pesticide-contaminated surface water sources are also a source for exposure. Bees seem to favor the still water of ponds, wheel ruts, and mud puddles for their drinking water. Investigators are still trying to determine whether the compounds in these water sources are harmful to bees at a lethal or sub-lethal level. Figure 2. Pollinators can be exposed to pesticides in various ways. Figure 3. 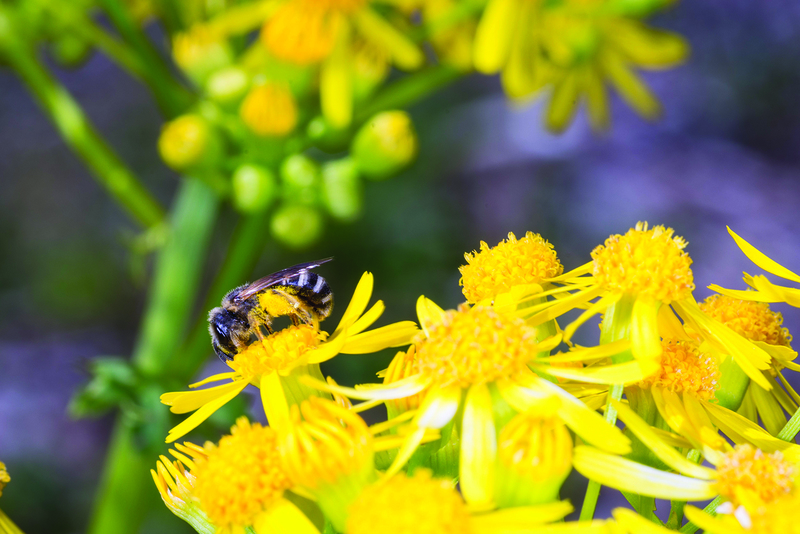 This ground-dwelling solitary bee is collecting pollen from a cressleaf groundsel flower. Figure 4. Insecticide that rubs off neonicotinoid-treated seeds during planting can come into contact with pollinators in or around this field. Figure 5. 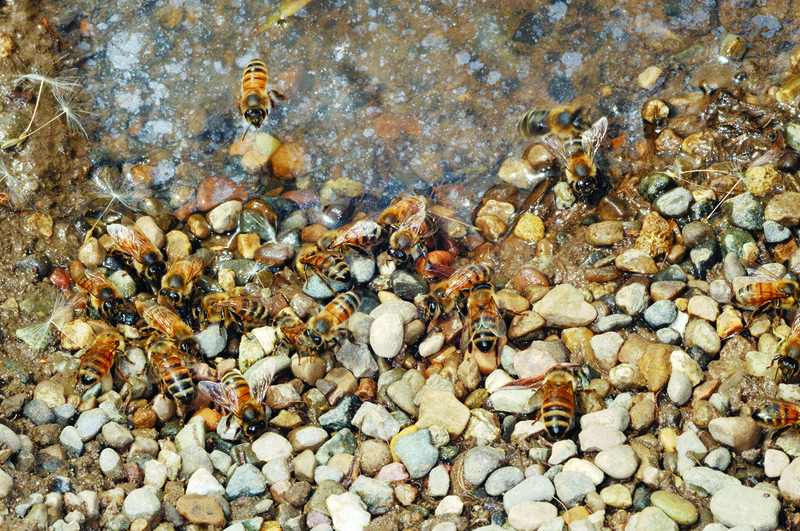 Honey bees drinking stagnant water next to a field. 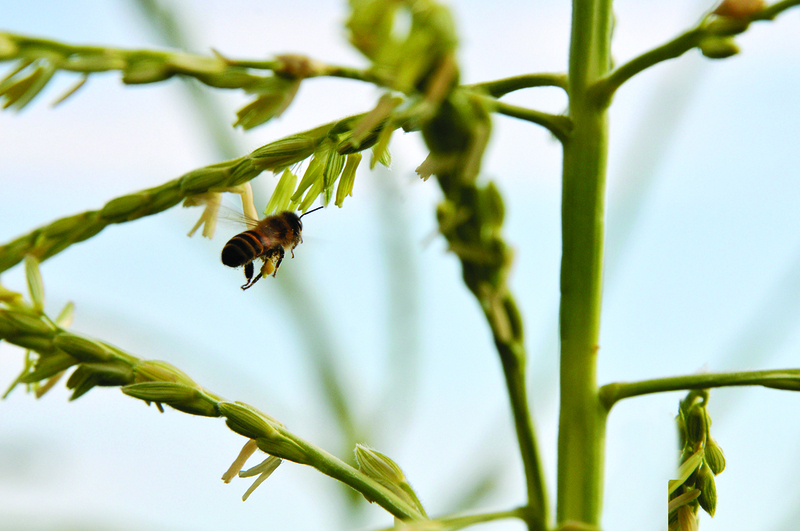 While insecticide use often poses some degree of risk for honey bees and other pollinators, here are six steps agronomic crop producers can take to reduce that risk. Insecticide labels contain specific instructions to help you reduce the risks associated with using the product. 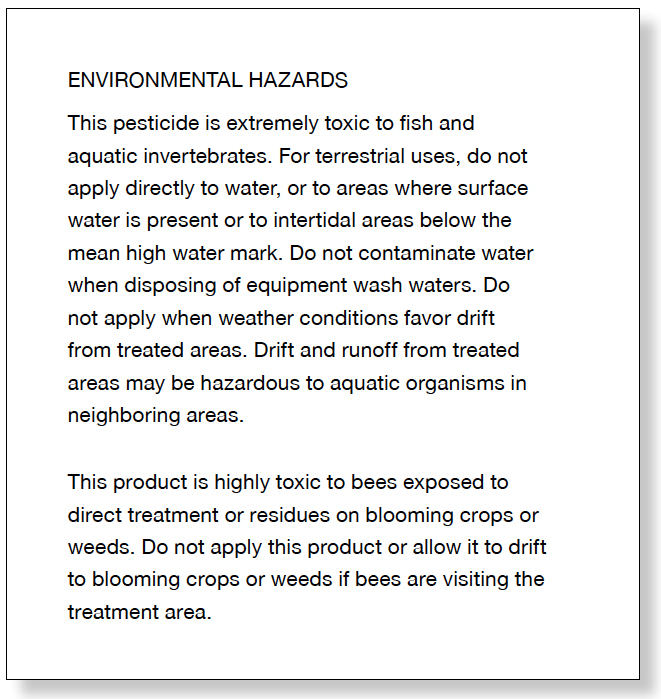 All insecticides that are toxic to bees have warnings on the label. On older insecticides, these warnings are often hard to find (Figure 6). 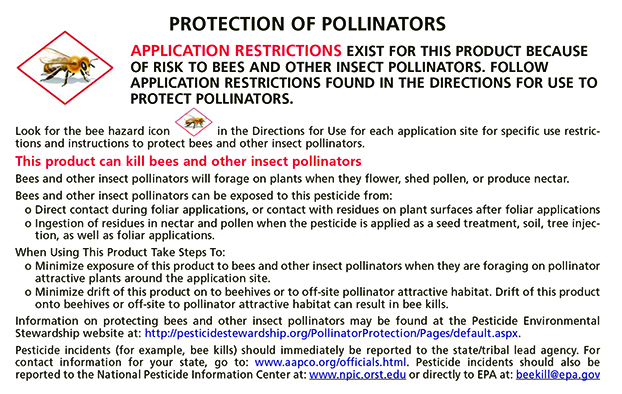 However, many newer insecticides have special “Protection of Pollinator” statements and icons on the label that draw attention to the potential for harm to pollinators, and they often have specific instructions for minimizing risks (Figure 7). Purdue and other universities publish research-based, crop-specific guidelines that specify when it is economical to control insects feeding on a crop. If you apply an insecticide when the insect pests numbers are below these thresholds, you not only waste your client’s money, you also risk exposing pollinators to the insecticides. Figure 6. On older pesticide labels, warnings about honey bee safety are harder to find. Figure 7. New pesticide labels include clear, distinct warnings if the product can harm pollinators. Integrated Pest Management (IPM) is a pest control system that combines knowing the biology of pests, determining the threat level, and choosing control methods that keep pest populations low while both keeping production profitable and minimizing adverse environmental effects. IPM practices have declined in agronomic crop production in the past 10-20 years as more producers have adopted a prophylactic approach — treating for the pest to prevent it, whether or not the pest is present or a threat. IPM practices can help reduce the risk of harming pollinators, because they can guide you to monitor pest populations and select control options (which often don’t require pesticides) that can minimize pest damage. Using IPM principles has the added benefit of saving producers money and time. For example, while soybean aphids are present in many fields each year, they usually do not reach economically damaging thresholds, so insecticide applications are often unnecessary. For a more detailed discussion of neonicotinoids and their effectiveness against soybean aphid, see The Effectiveness of Neonicotinoid Seed Treatments in Soybean (Purdue Extension publication E-268-W), available from the Education Store, edustore.purdue.edu. Figure 8. 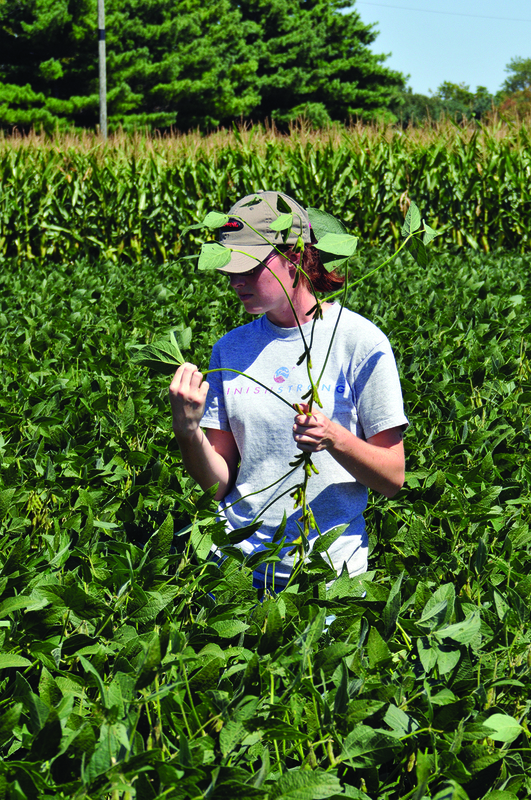 Scouting fields helps detrmine whether insect pest populations are at a level that warrant treatment. Virtually all of the corn and most of the soybean seed planted in Indiana is treated with one of the neonicotinoid insecticides: clothianidin or thiamethoxam. These insecticides are exceptionally soluble in water, are stable in soils, and move with water into plants. These characteristics can provide pest management benefits, but also threaten pollinators in ways that older pesticide classes cannot. Neonicotinoids are also among the most toxic pesticides for pollinators. The target pest insects for seed treatments are early-season pests such as grubs, wireworms, black cutworms (corn), and bean leaf beetles (soybean). However, these pests do not frequently occur in numbers that can damage a crop, so seed treatments are often unnecessary.If you often have problems with one or more of these pests, then using treated seed is an option worth considering. Currently, there is little market demand for untreated seeds. As a result, growers seeking elite varieties often don’t have the option of ordering untreated seed. However, if growers request these options regularly, vendors will respond. Untreated seed has the additional benefit of reducing costs associated with insecticide. Figure 9. The insecticide coated on this corn seed is intended to help protect the seed from occasional soil pests; however, it can have the unintended effect of harming pollinators. Not all insecticides are equally toxic to pollinators. When possible, select the least toxic insecticide that will still provide good control of the target pest. While we don’t have toxicity data for most native, unmanaged pollinator species (that is, pollinators other than honey bees), Protecting Bees From Pesticides (Purdue Extension publication E-53-W) lists the relative toxicity of many pesticides to honey bees. This publication is available from the Purdue Extension Education Store, edustore.purdue.edu. If you must use insecticides, you can take steps to reduce the hazard to bees and other pollinators. Avoid dusts whenever possible. This includes avoiding insecticides that have dust formulations. It also includes following practices that minimize the amount of planting dusts you create. 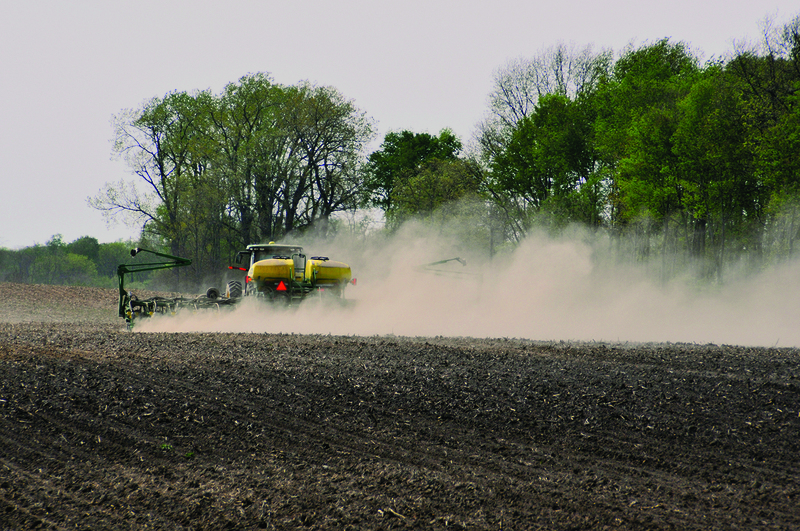 It may be unavoidable in some cases to completely eliminate dust when planting treated corn and soybean seeds. However, treated seed guidelines advise growers to account for wind speed and direction during planting to minimize dust. Pay attention to when you apply. Apply foliar insecticides in the late evening, night, or very early morning when fewer pollinators are foraging. Applying at these times can also minimize the spray drift and volatilization that can occur during the higher heat of the day. Keep your applications on target. Do not apply insecticides when winds favor drifting. And whenever possible, use ground applications instead of air applications. Pay attention to your surroundings. Avoid spraying when the crop or other plants in the field or nearby fields are in bloom. Keep in mind that those flowering plants may be weeds — pollinators will still be foraging on those flowers. If growers, pesticide applicators, and beekeepers communicate and cooperate better, we can prevent many bee poisoning problems. For example, honey bees forage far beyond their colony, which means you should notify all beekeepers within 2 to 3 miles of the area to be treated at least the evening before an insecticide application. If beekeepers are to move or confine their bees, they must do so the night before the treatment. Also, consider that insecticide application in Indiana agronomic crops is greatest during corn and soybean planting. 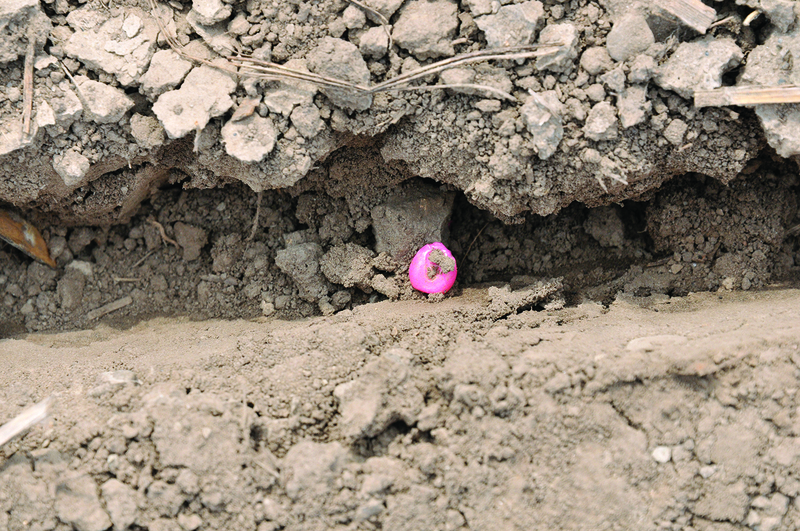 That’s because of the large volumes of neonicotinoid-treated seed being used and drift associated with planting. For this reason, it is always prudent to consider planting time as an insecticide application, too. In other words, notify neighboring beekeepers before planting. Figure 10. 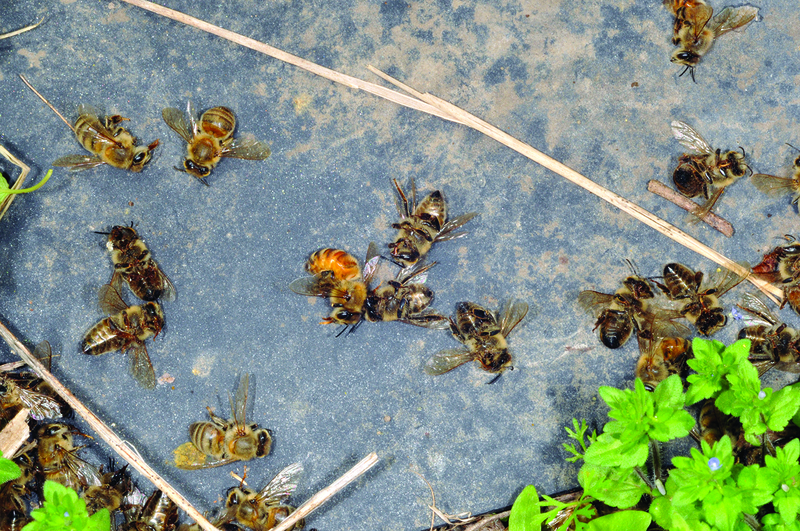 The sudden appearance of dead bees outside of hives is often a sign of pesticide poisoning. Many growers decide to use insecticides only hours before applying them. Again, always be aware of the locations of hives within 2 to 3 miles of your crops, and know how to contact the beekeepers who own them. If you need help finding beekeepers in your area, there are a few options. 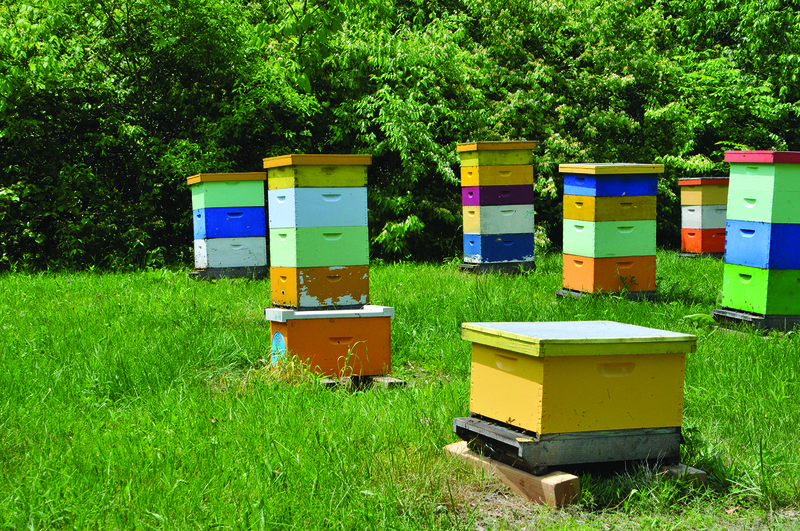 First, your county extension office may be able to tell you about the beekeepers in your area. In Indiana, you can find your Purdue Extension office at extension.purdue.edu/Pages/countyoffices.aspx. Another good resource is your state apiary inspector. Most beekeepers register their hive locations with the inspector. In Indiana, you can contact the state apiary inspector, which is part of the Entomology and Plant Pathology Division of the Indiana Department of Natural Resources: www.in.gov/dnr/entomolo/2899.htm, 317-232-4120. Increasingly, beekeepers also are using the FieldWatch.com, which includes resources for both beekeepers and crop producers. Figure 11. Hives in an apiary. All photos were provided by and are the property of John Obermeyer, Purdue Entomology. All illustrations by Purdue Extension.